Project Barracuda a ‘Reel’ Success! 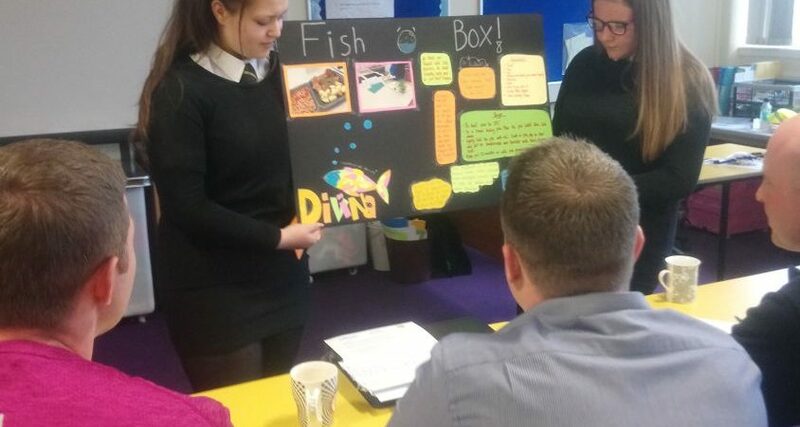 Last week ‘Project Barracuda’, the excellent collaboration between Arbroath Academy and Dawnfresh Seafoods Ltd came to a very successful conclusion with pupils presenting their finished products to a panel of judges, Dragon’s Den style! 5 weeks ago, S3 Home Economics pupils were given a project brief from Graeme O’Brien, Quality Manager at Dawnfresh Ltd, to design a new fish product that could be sold to consumers. Tying in perfectly with the existing curriculum around product design and development; pupils had to work in small project teams to come up with an idea for a new product, carry out research into competitors, create a unique selling point, decide on pricing, branding, the packaging and identify who their target market would be. This was the first time many of the pupils had ever worked on a project based task such as this. Where the focus was on team work and collaboration, with the end goal of delivering a finished product to a judging panel who acted as a supermarket looking to invest in the next exciting fish dish. For many of the young people involved this was very much outside their comfort zone, with the thought of delivering a presentation at the end of the 5 weeks to a panel of strangers extremely daunting and something they had no previous experience of doing! They had to overcome many challenges and considerations, such as deciding who was going to carry out each role within the team, what the individual strengths of their team members were in order to get the best results, as well as learning time management skills and developing the ability to stick to project deadlines. Pupils also had to cook the product and go through a few processes of trial and error before deciding on a final product. The judging panel heard from 9 groups in total from two classes and the standard was absolutely fantastic! The judges were blown away by how much hard work and effort each of the pupils had put in throughout the 5 weeks, with a couple of groups even working on the project after school hours and cooking their product in friends’ houses! The groups took turns to present and answered questions from the judges around why they chose to develop the product the way they did and what successes and difficulties they encountered along the way. They were also asked questions on what skills they think they have developed from taking part in this project and one of the strongest themes to come out was the team working aspect. Pupils quickly realised that to achieve their goal they had to work together and utilise every team member’s individual strengths. Something they will have to do regularly in the world of work, regardless of what industry they choose to have a career in. Every group was excellent in their own way, however two groups stood out from the two class sessions. The winning team in group 1 was ‘Under the Sea’ with their product “Sea Sushi” and the winning team in group 2 was ‘Necell’ with their BBQ Skewer Fish Basket. All teams received certificates for taking part and the winning two teams received Dawnfresh medals, along with a Dawnfresh Trophy that was presented to the school. Having spoken to the teachers involved with this project, they were so impressed by the dedication and hard work of the pupils and how they really embraced this challenge and new style of working. They were able to see the confidence of their pupils grow as the weeks progressed and watch pupils who would previously never have been able to stand up and present to 3 adults deliver assured and confident presentations, which was incredible to see! 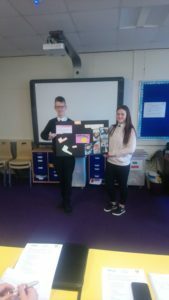 For the pupils, they were able to link what they learn in school to industry style working practices and develop various transferable skills that will help them far beyond school. As a business, Dawnfresh were extremely impressed by the output and effort of the pupils and could clearly see how their intervention has made a huge difference to how the pupils now view their industry; their understanding of the processes involved in product design and development and the key employability skills that they have learned. The business is keen to replicate this project again next year with a new cohort of pupils and build on this success, which is great. Our DYW Team see this project as another excellent example of what DYW fundamentally is and can be. This for us is DYW in a nutshell. Industry directly getting involved and working in collaboration with education to support and influence the curriculum to benefit young people, develop skills and raise industry awareness. We look forward as a team to working with Arbroath Academy and Dawnfresh as their relationship develops and we are already excited to be involved in next year’s Project Barracuda! If you are an employer who would like to work with education in some way, or a teacher who would like to engage with industry to benefit your pupils, then please contact our DYW Dundee and Angus team who will be able to advise and guide you through the process.